Shelf Master provides a wide range of plastic storage bins, plastic containers, and label systems to organize your picking areas. Contact one of our knowledgeable customer service representatives to help you with your inventory or picking areas. 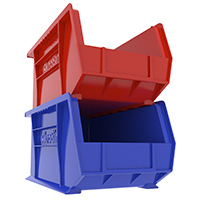 The perfect replacements for flimsy, corrugated bins, Shelf Bins are molded of durable polypropylene. Shelf Bins fit standard 12″, 18″, and 24″ deep shelving, or vertical storage and retrieval units. Waterproof containers are unaffected by grease or oil. 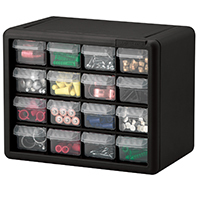 Great for storage, transfer and shipping applications. Heavy-duty containers stack with or without lids, and nest when turned 180°. Molded from high-density polyethylene, NST’s resist solvents and chemicals, and won’t flex under heavy loads. Meets FDA regulations, for use in meat and poultry plants. Scan-thru pouches and pockets for holding bar code labels and product location cards. Selection includes adhesive, magnetic, c-channel, sealtite, clear vinyl, tubular, tag, other styles. Custom made to identify locations, provide warning, and area markings. Use signage made with custom cut vinyl characters on a rack, aisle, door, dock or hanging from the ceiling.